Mark Abriel, of Lightwave Films, has written, produced and directed an extraordinary, one hour-long, independent documentary movie, with profound implications for our world, our place in it and our understanding of the nature of reality itself. 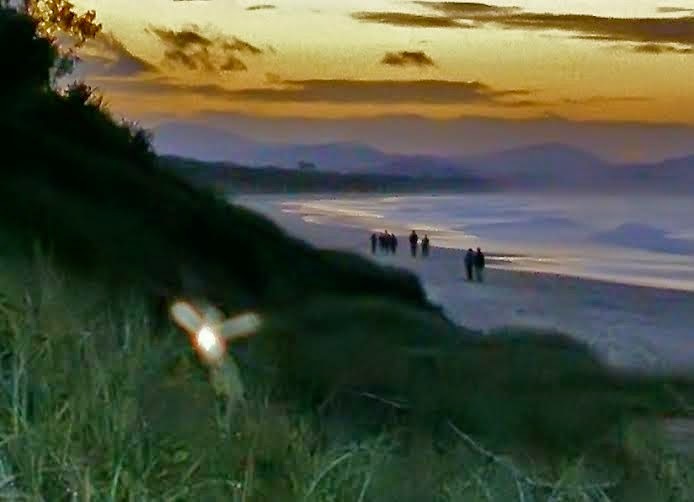 In Evanescent, shot on location on the beach at Byron Bay, Australia and also at Burleigh Heads Forest, Australia, Abriel has captured an intriguing array of anomalous, luminous phenomena that give every appearance of being manifestations of a parallel, living reality that exists cheek by jowl with us, albeit that most people, most of the time, remain perfectly oblivious to it. Using state-of-the-art, high-definition still and video cameras, Abriel has produced a unique chronicle of these bio-energetic lights that clearly react to human presence and activity, and yet, just as clearly, are in some wise separate from us. Interestingly, the lights that Evansescent presents are similar to other anomalous lights that have been studied since the 1980s in the Hessdalen Valley of Norway. 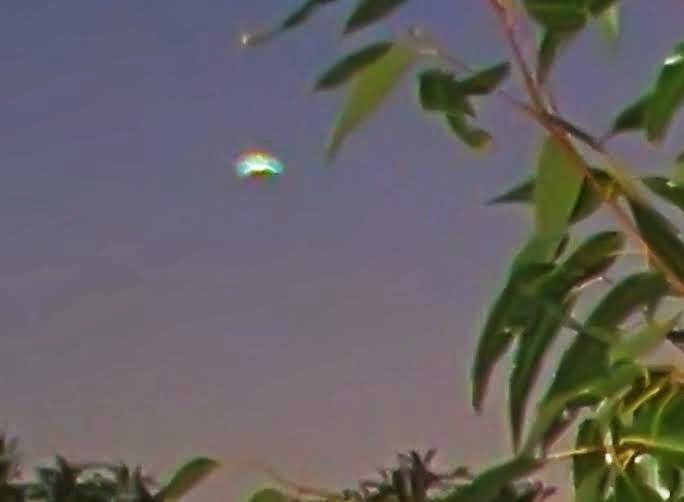 In a fascinating aside, Italian astrophysicist, Dr. Massimo Teodorani, a member of the scientific team studying the Hessdalen lights, suggests that the lights that Mark Abriel has captured on film in Australia may not be plasmas, or purely energetic phenomena, but may be actual, three dimensional objects. This presents an interesting possibility: could it be that a sort of dimensional shift or melding is underway between the ostensibly “solid” 3-D world in which we live and the seemingly more insubstantial, light-filled realms of higher dimensions? That these little, flitting, lights that corkscrew through the air, zoom and loop around people's heads, flit through the rocks and underbrush, or hover enigmatically nearby, in the air or along the ground, that present themselves as marble-sized, opalescent little pearls of light, or as diaphanous, pastel-hued, geometrically regular, insect-like forms, or intensely yellow-white lights in mid-air, could be analogous to the fine stitches of delicate thread that sew two, disparate pieces of cloth together? Is our world being subtly, elegantly, energetically, artfully transitioned to a new state of awareness-matter-form-energy-frequency-manifestation for which we have absolutely no words? Are these lights the inter-dimensional midwives come to help birth a New World? Is that it? Is that what Mark Abriel is chronicling with his photography and videography? I ask, because, serendipitously, I have seen similar lights, lights that resemble some of the ones Evanescent depicts, but in the rural Ecuadorian Amazon region, on the other side of the world. Moreover, the lights I have seen have been with the naked eye, moving at a very leisurely pace, just meandering around in my near vicinity, very bright, marble-sized, with an intense, yellow-white glow. Abriel's documentary covers the period 2006 to 2014, whereas I observed the lights in the Ecuadorian Amazon multiple times in 2012. Evanescent concludes, and I concur, that these lights are not insects or any other, known, biological, life form. And yet they exhibit very life-like, highly energetic behavior that clearly reacts to human presence and intention. In a word, this is precisely the sort of thing we could plausibly expect were we to bump up against and to begin to integrate with another, luminous, dare we say, playful, and even inquisitive, dimension. I doubt it is a coincid-ence that these enigmatic lights are seen in the Amazon, along the Australian seacoast, where land meets sea, or amongst the rocks and vegetation of the forest, or in a remote valley in Norway. No, without a doubt, it is precisely in those places, where the planet's life force still resonates with natural, vital energy, that the dimensions can join, in a gentle, sacred, almost shy, mating dance, if you will, of spontaneous, extemporaneous exploration and discovery; where the two parties to the union scarcely know each other and yet are destined to join together in an exotic, mysterious, deeply alluring embrace, the natural issue of which can scarcely be apprehended in advance. Is the light penetrating into our world, or are we advancing, in spite of ourselves, into the light? There is so much darkness in the world – crime, war, environmental destruction, economic exploitation and more – and yet, in spite of all of that negative baggage, are we even now crossing over a subtle, inter-dimensional threshold into a hyper-dimensional congress with playful, bio-energetic life forms that are drawing us deeper into a sort of transformative symbiosis that will jointly define us as we penetrate more profoundly into an ongoing, so-far-unacknowledged and unrecognized (by the great mass of humanity) dimensional change? Evanescent is uniquely Mark Abriel's brainchild and creative expression. The beguiling soundtrack music, now Haydn, then Beethoven or sitar or guitar music, some of it performed by Abriel himself – the videography and photography, the natural settings on the beach and in the forest, the conversations with friends and technical and scientific personnel – all bears his distinctive visionary stamp. And Evanescent is a visionary piece of art, in this sense: Mark Abriel has done what all inspired artists do – he has taken the seemingly ordinary elements of everyday life, visually distilled out the often overlooked, peripheral magic that surrounds us on every side, and slowed it down for our leisurely inspection. He has disassembled seemingly ordinary visual facets of everyday reality, and then re-presented them in such a way as to reveal the remarkable reality that lies concealed within the ostensibly “ordinary” world in which we live and move, and which to this point has gone largely unremarked. This, then, is the central theme of Evanescent: we are interacting with another dimension, an energetic, luminous dimension that is all around. Put a little differently, a dimensional, light-filled shift is upon us. Do we tightly shut our eyes against the magic of it all, or do we take it all in with amazement and wonder, and embrace the adventure on which we have already jointly embarked unawares? Mark Abriel's Evanescent answers in the affirmative. It's all in. I do need and accept donations, now more so than ever. If you find something of value in my ideas, writings and adventures please support my continued work. Contact me at: dr.samizdat1618@gmail.com for instructions on how to donate. Forget all about whatever you were told in school about how the world works. Stay with me as I lay out a better schema, that more accurately reflects the way the world is run. It all has to do with the study of ecology, and energy, and information flow. Because, you see, energy is fungible, and so is information. In fact, energy is transformable into information, and vice versa. In other words, the complex interplay of energy and information, broadly conceived, yields an ecology, a dynamic system with myriad feedback loops, positive and negative, whether biological, political, economic, social, etc. This reality has been well understood by leading thinkers and analysts for many years. As the years have gone by, ecological modeling of all kinds has gotten more and more complex. This has everything to do with how the modern world is run. Most people have never heard of Howard T Odum, the influential 20th century scientist and thinker (or his brother Eugene P. Odum, with whom he wrote the first modern textbook of ecology), including a lot of scientists and intellectuals, and neither had I before I matriculated in forestry school, to earn my second master's degree. But Howard Odum's ideas and prodigious body of intellectual work have arguably done more to establish the modern discipline of ecology than anyone else's. Perhaps Odum's biggest insight was that the world, and everything in it and on it, is energetic. The corollary to that is that the entire global system, every facet of it, from the microscopic to the macroscopic, is all energetically interconnected. In fact, everything is interconnected electrically. Odum realized early on that the Earth system, all of it, was essentially an unimaginably complex electrical circuit, that could be modeled as such. And he set about doing that. He started with incoming solar radiation, which is nothing but a stream of a near infinite flood of photons, subatomic particles and electromagnetic radiation. But, you see, all of this great flood of energy from the Sun carries an electrical charge. Photons, for instance, come barreling in at the speed of light and strike chlorophyll molecules in the leaves of photosynthetic plants and phytoplankton. That in turn initiates a cascade of electrochemical reactions in photosynthetic organisms that ultimately powers biological life, because it forms the basis for a great deal of the energetic activity that takes place farther along the ecological chain in the biosphere on this planet. And it all starts with mind-bending quanta of light energy from the Sun, our local star. Odum produced complex, essentially electrical diagrams that modeled this complex, energetic, give and take; not only between biological organisms, but between the biosphere and the geosphere, the atmosphere, the hydrosphere, and so on. For example, it is well known that coal is fossilized plant material, from ages long past. Through powerful geological processes, thick seams of decaying vegetation were buried deep underground a very long time ago, and converted into a mineral form, to solid, black, rock-hard chunks of carbon. But for Odum, this coal represents stored electrical energy = solar energy from ages long past. It is part of the electrical, energy budget of the planet -- with a lag time of unknown thousands or even millions of years. So Odum's ecological analysis has a temporal dimension that extends across vast expanses of time. A seam of coal for him, using his electrical model, is then analogous to a capacitor, or maybe a diode, in modern electrical theory. It is passively storing solar energy from long ago, with the capacity to release that energy in the form of heat, let us say, in the furnaces of an electrical generating plant, that may then produce steam that in its turn can cause turbines to rotate in order to power massive electrical generators that then produce electricity that is sent coursing out into the national electrical grid. Remember, energy is fungible, most fundamentally at an energetically electrical level. So it is that a tropical forest, in the time of the dinosaurs, was transformed into coal, lay deeply buried in hundreds or thousands of feet of rock and sediment for millions of years, only to be excavated in the modern period, and transformed into electricity. The burning of the coal in the electrical generating plant then produces electricity and also poisonous side products such as coal ash and toxic fumes, which economists consider to be negative externalities, and which ecologists consider as environmental contaminants, that wreak havoc with living systems. This is but one, small example, notwithstanding that it links the world of the dinosaurs directly with ours, across an unimaginable stretch of time and space, and drives home just how complex this world is, and how interlocked and interconnected it is -- even on a geological time scale. 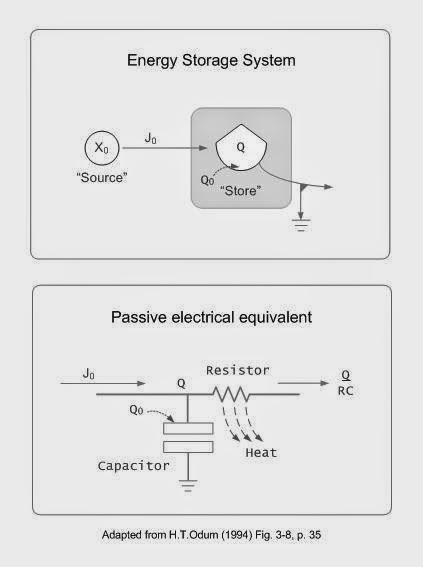 Odum understood all of this in basically electrical terms. Here is a very simple diagram that illustrates how Odum modeled the Earth and its myriad component systems and subsystems. Using the example of the coal and the electrical generating plant, the source of energy input is ultimately the Sun, millions of years ago. The capacitor that stores the Sun's energy, via the agency of decayed, photosynthetic vegetation, albeit with an enormous, ancient, time lag, is the coal. When the energy is discharged from the capacitor (coal), by burning in the furnaces of the electrical power plant, and used to produce steam, there is resistance to the coal's energetic discharge, in the chemical reaction of the fire, in the friction of the spinning turbines, and so forth, all of which produces heat, as a side product of the indirect transformation of ancient solar energy into modern electrical energy. In reality it is the same energy all along, then and now. Remember that energy is fungible, even across vast stretches of time and space that stagger the mind. And remember, as well, that energy can be transformed into information, and vice versa. That is both an exoteric and and esoteric truth. 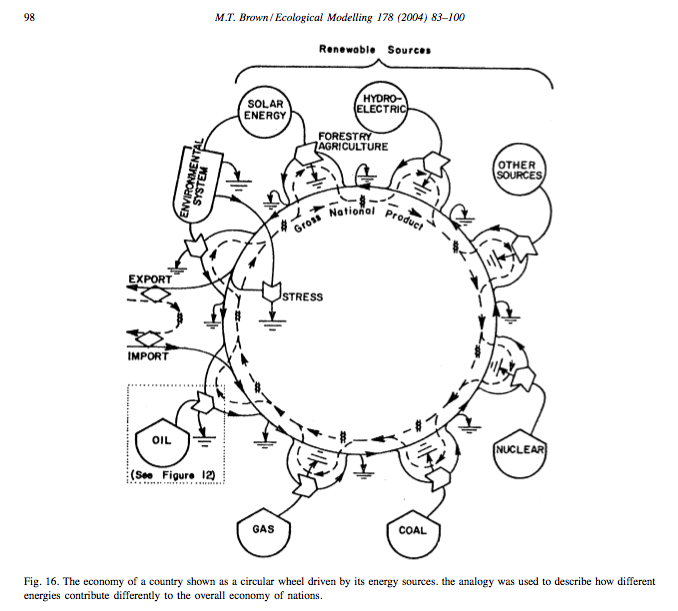 Odum's ecological circuits were quite complex, with myriad, intricate feedback loops. Due to their size, it is difficult to reproduce them here. But you must understand that his ecological modeling has been extended right into the realm of economics and power politics. Remember that everything is interconnected. Everything. Those who would rule this world understand that, and so did Odum. Here's an example of what I am talking about. It's a sketch from one of Odum's own notebooks. He is modeling the ecology of war, if you will, between two nations, their assets, their resources, the interplay between those factors. And he has scribbled some equations out to the side that model that violent ecology. We can't see how he defines the terms in the equations, because we don't see the rest of his notes, but you get the idea. He is modeling war mathematically, energetically. The same can be done with any national economy. Keep in mind that Odum is formulating a dynamic, energetic model. as opposed to a purely economic model. Here you see the energetic inputs to the national economy from oil, gas, coal, hydroelectric, solar and nuclear power, and inputs from the forestry and agricultural sectors. He also depicts the input and output from imports and exports, as well as the environmental system, and interrelates the whole in a circular fashion, denoting the largely closed character of the system, as it mostly is on a small planet like the Earth. Given the feeble, limited mentality of those who would lord it over humanity and the Earth (notwithstanding that they imagine themselves to be geniuses without equal), we are unfortunately trending in the direction of an unbelievable dictatorship such as has never been seen on this planet in all of recorded history. An all-encompassing surveillance grid is being rapidly set in place, to lock down everyone and everything. The NSA and other espionage agencies are compiling massive, digital data bases, with the minutiae of daily life of millions, even billions of people. To include that individual and aggregated data in their planetary, ecological system modeling, of course. Humans, individually and as a group, are a phenomenal source of energy. Humans are the grand wild card in the closed ecological equation on this planet. So those who would model war, in all its global parameters, or economic and social control, in all their global parameters, must have massive amounts of information on all individual humans and aggregated data on all human groups on this planet. Remember, ecology is all based on energy flow, which is essentially electrical, and energy is fungible; more than that, energy can transform into information and vice versa; so those who would control the planetary ecology, in all its dimensions -- biological, social, economic, etc. -- must control the planetary energy flow, and that includes surveilling and controlling the information profile and flow for individual humans and all human groups; because energy can transform into information and vice versa. Information is data, so by acquiring and controlling your personal data, as much of it as possible, they aim to control your energy, and thereby to ultimately control the human ecology on this planet. Remember, it all has to do with electrical energy and the control of it. What am I talking about? Just this: a natural human being is an exquisitely tuned, hyper-dimensional circuit, and this universal fact is well understood by those who would control you. In your body, are billions of DNA molecules, which have a double-spiral shape, analogous in some respects to an ordinary electrical coil (or an electrical transformer, which steps voltage up or down), with one salient difference: under certain conditions, the DNA molecule is superconductive, which is to say, when conditions are favorable, it may conduct phenomenal, unbelievable amounts of cosmically conscious, bio-spiritual electricity from superordinate levels of the Universal, hyper-electro-conscious construct. This is the basis of the full-blown kundalini phenomenon when untold thousands of volts of bio-electricity surge through the body, without however electrocuting or burning the body up. Rather, when carried to its ultimate conclusion, the kundalini process is conducive to greatly expanded states of awareness and personal realization that the average person can little comprehend. Moreover, the human body itself carries a definite bio-electrical charge. It is, therefore, directly analogous in some ways to an ordinary electrical capacitor. Well, in electrical theory, capacitors and coils form tuned circuits. Tuned circuits are the basis of electronic oscillators, amplifiers, and radio and television transmitters and receivers. As I just mentioned, a natural human being is an exquisitely tuned, hyper-dimensional, tuned circuit, and this universal fact is well understood by those who would control you. You are meant to be a super-conducting, universally amplified, cosmically resonating transmitter and receiver of energy and information. Remember that energy is fungible, and that energy can transform into information and vice versa. Remember that the entire planetary ecology is based on energy. It is all essentially electrical in nature; i.e., Nature is electrical, and so are you, though your electricity is (potentially hyper-) conscious, bio-electricity. Now you know the reason for such repressive control of the economy by the USSA Federal Reserve Bank, the Bank of England, the European Central Bank; the reason for the riots in the Arab countries, the so-called Arab Spring, the "Color Revolutions" of multi-billionaire George Soros who fronts for filthy, Zio-Nazi factions. Now you know why the Rothschilds, Rockefellers, Windsors, Warburgs, Schiffs, Carnegies, Morgans, Bushes, et al, have for centuries been funding an endless succession of wars, invasions, coups, assassinations, civil wars and mercenary armies and causing ruinous commodity price fluctuations, inflation, then deflation, rigged markets and promoting narcotics trafficking, human trafficking and all manner of criminal activity that even the lowest animals shrink from engaging in. It is all done to block, interfere with, stop, change, distort and impede the normal flow of hyper-conscious, universal, cosmic, bio-electricity in the greater human ecology of this planet. It is all extensively modeled using extremely intricate multivariate analysis, incredibly detailed econometric models, using reams of data, crunched through more and more powerful computers. That is why the NSA has unbelievable acres and acres of supercomputers in its massive, underground base at Ft. Meade, Maryland, going down and down underground, deeper and deeper, level after level. That is why the NSA has built a huge new facility at Bluffdale, Utah with yet more supercomputers. As the world population swells, as the economy grows, as technology advances, it all becomes ever so much more complex -- hence the need for ever more and better data, right down to the individual producing and consuming unit -- the individual human being. Whence the all-pervasive surveillance of as many human beings as possible. Where they live, what they do, what they buy, what they produce, how much money they have, their state of health, whether they are a social or political activist, with whom they interact and how and when and why, etc. It is all data, being fed into vastly complex algorithms, and crunched through A.I. computer systems to not just model, but to manage and administer the global system, in all its myriad dimensions, right down to the individual level. The ultimate aim is to totally control you energetically. Because they understand your hyper-conscious, universal, energetic potential, and the dark controllers want to make sure you never get anywhere near your hyper-conscious, universal, energetic potential. The whole system is set up to thwart that. You could call it the dark ecology of anti-hyper-conscious, universal, energetic potential. That's what we are dealing with. We are engaged in a very serious energetic contest for all the marbles, for the planet and for our very souls themselves. These next months and years will be like nothing any of us have ever experienced in our lives. I do need and accept donations, now more than ever. If you find something of value in my ideas, writings and adventures please support my continued work. Contact me at: dr.samizdat1618@gmail.com for instructions on how to donate. My recent article, Harmaline Wonderland of Gnomes, Elves, Faeries and Sprites, brought a fascinating response from an unexpected quarter. 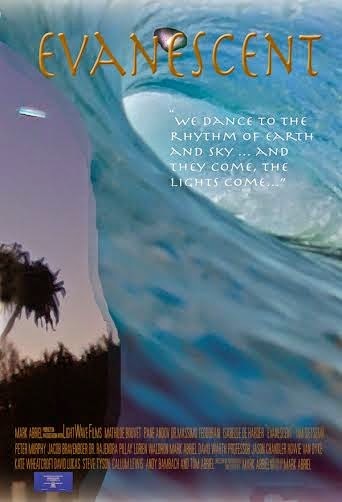 Mark Abriel, chiropractor, healer, visionary, energy worker and director and independent producer of short films, has recently issued a one-hour movie, filmed at Byron Bay and Burleigh Head National Park, Australia, that deals with some of the same luminescent, energetic, life phenomena that I have witnessed in the Upper Amazon region of Ecuador. I don't think they are biological life forms; but it does seem to me that they are alive, and quite possibly sentient. They clearly react to human presence. A two minute trailer for Mark's film can be viewed here: Evanescent. At the 1:03 mark he has a photo of something that somewhat resembles what I have seen myself on multiple occasions in the Amazon region. 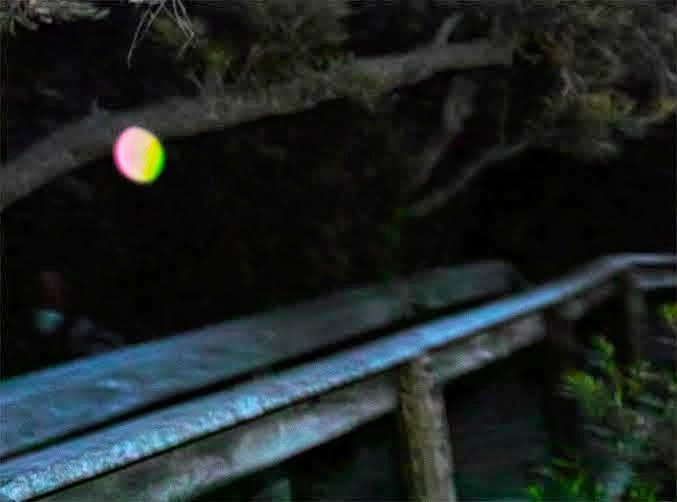 While Mark uses high speed camera and video equipment to catch fleeting images of these intriguing, luminescent phenomena, I have seen much the same thing in the Amazon, but without any high-tech video or camera gear, at a much slower, almost leisurely pace, with natural, unaided vision. 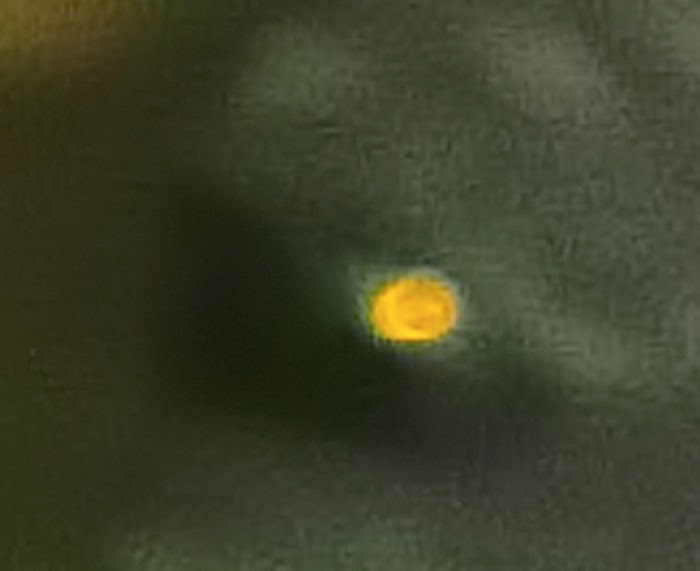 What I have seen are really bright, yellowish-white, little lights about the size of the marbles that little boys play with (or used to years ago). On occasion they would meander along behind me or in my near vicinity as I walked down the trails, at head height or a little higher. I first noticed them when one evening I was walking along the trail from a creek, and happened to suddenly turn around for some reason, and noticed one following right behind me. I was a little bit startled. The light was so bright that at first I thought the shaman with whom I lived at that time, was trailing me for some unknown reason, holding an extremely bright flashlight above his head. I quickly ascertained that that was not the case. Then I incongruously thought that there must be a tiny, miniature, silent helicopter or drone of some kind, with a very bright searchlight, tailing me for unknown reasons. But I quickly ascertained that that was not the case, either. Besides, I was in the rural Amazon. Then I thought the light must emanate from phosphorescing insects. But I never could see any insects, try as I might; and besides, the intensity of the light was so prodigiously bright, and persisted for so long, that I also abandoned that thought. It was hard for me to conceive of any glow bug generating that kind of intense wattage. I finally decided that the lights were of unknown provenance and simply accepted them for the unknown entities that they were/are. Mark Abriel sent me this image that he snapped of something that closely resembles what I saw, though what I saw was much brighter, more intensely luminous, with an almost searchlight- like brilliance, without, however casting a shadow or beam of light. Now it is true that I have gone a very small distance into some of the preliminary mysteries of Amazonian shamanism, and that part of that journey has involved seeing and/or interacting with a surprisingly large spectrum of spiritual denizens of the cryptic precincts of the Amazonian shamanic plants. However, I want to emphasize that I always saw what I am narrowly describing here, while in my normal waking consciousness, in the conduct of my normal daily routine. Albeit that that routine took place in those days in the rural Amazon, and so was not at all the routine of a city-dweller in a large, modern, conurbation such as Greater London, England or Paris, France or New York City. I could however liken it in some wise to certain visions that malicagua showed me, with the caveat that I cannot say exactly when or how malicagua showed me what I am about to relate to you, due to the fact that when you enter more deeply into the consciousness of the Amazonian plant realm you gain access to a way of knowing that is not strictly delimited and delineated by the narrow strictures of the modern, "civilized" concepts of linear, industrial, clock time and coordinate, grid-based, Cartesian space, as understood by classical, Western, natural science. Be all that as it may, multiple times malicagua showed me immense lights in the sky, that must have been in very high Earth orbit, or even much farther out than that, perhaps at about the distance of the Moon that presently orbits the Earth. I mean to tell you, those babies were whopping HUGE, and whatever they were, they were very well lit up. I remember thinking, "What in the world is that? It must be the Moon. It's awfully big and bright." And then I would remonstrate internally, "No, that can't be right, because the Moon is over there, on the other side of the sky." Then I would think, "But what can be the meaning of this? Because there are three, no, four of them!" You have to understand that one of the peculiarities of malicagua's impressive field of awareness, is that it is not bound by the confines of linear time, as is our everyday consciousness; to wit: it has a propensity to sometimes (though not always) show you future events with an impressively high degree of fidelity and probability. I would not think of troubling you at this pass with a litany of trivial detail in that regard; suffice it to say that it is so. I cannot possibly say with any certainty, but it does raise the question as to whether the Earth may at some possible, relatively near-future date entertain, shall we say, visitors from elsewhere or elsewhen or otherwise? Who may show up as galactic adults to announce to the deranged, satanic regents of this planet: "Enough. Now we will bestow on you the reward that you have worked so very hard and so very long to merit." And then they will hand out, how to put this diplomatically? -- "merit badges" -- to the Trilateralists, the European Royals, the Bank of England and ECB, the BIS, the Council on Foreign Relations, to Skull and Bones, the Zionists, the CIA and NSA, the Pentagon, the Vatican, ISIS/ISIL/IS, the Mexican Mafia, the Yakuza, to the USSA Federal Reserve, the City of London, Wall Street, etc. They all get rewarded, without stinting, nothing held back at all, in direct proportion to their life's body of work, perhaps extending over an impressively long, sequential string of dark, evil incarnations. The "visitors", look back through the family tree, the DNA, the many millennia-long, karmic tab, and tally it all up. And their verdict is final. There is no appeal. Time is up. They are the Supreme Court, so to speak, God's Deputy Regents over the Earth. Of course, I am an ordinary flesh and blood man, like you. I can obviously speak for absolutely no one beyond myself, least of all for God and His Holy Regents. They are all w-a-a-a-y above my pay grade. But I have seen enough through the plants to know that we are not alone, oh, no sir, no ma'am. Not at all. Not by a long shot. Could it be that those who think that they are "important" in this world are the very ones who will one day learn exactly who really is "important", and who is not? Is it a lesson that they have adamantly, categorically refused to learn, and so they categorically will not learn it, right up until the time that they unexpectedly do? And in that decisive moment, will they suddenly understand with excruciating clarity exactly what abject humility is, though it will be much too late for them by then? Is that the way it is? I would hasten to add that malicagua is definitely not for the idly curious, the physically or psychologically frail, the faint of heart, the shallow and superficial minded, or for recreational use. So if you are not on a very serious shamanic quest, don't even think about it. Stay away from it and the Amazon. I love this song by K.D. Lang. Uma Thurman's gracious self requires no editorial comment, beyond registering a self-evident 10+ on the babe meter. I do accept and need donations. If you find something of value in my ideas, writings and adventures you are certainly welcome to support my continued work. Please contact me at: dr.samizdat1618@gmail.com for instructions on how to donate. Obedience to the government, and trust in its directives, is instilled in us by the mainstream culture our whole lives. As school children, and in our university studies, we are taught about the formal structure and function of government. We are taught to accept without question what the government says and does, and to believe in its essential goodness, honesty and trustworthiness. The truth is that in the USSA, Great Britain, Italy, Japan, Germany, Egypt, Israel, Australia and virtually every nation all over the world, there is a secret, or shadow government that secretly pulls strings behind the scenes. The shadow government operates outside the bounds of the law and the formal constitution of the government. It is often massively funded by so-called “black budget” finances, or off the books funding that may be raised by a variety of means, including, but not limited to: 1) narcotics, weapons or human trafficking; 2) outright theft, embezzlement or transfer of national or state resources by illegal, criminal procedures; 3) plunder of other nations’ resources in warfare; 4) fraudulent conversion of national treasury assets under color of unconstitutional laws or regulations that are wrongly presented to the public as being lawful; or 5) via massive interventions in markets of various sorts through “front” companies and clandestine, market rigging. Understand that all of the foregoing is carried out by a wide variety of government officials, including kings and queens, presidents and prime ministers, members of parliaments and other representative, elected bodies, secretaries of national government departments, high ranking military officers, heads of national central banks, and other prominent officials. Intelligence and military agencies are heavily involved in the shadow government. In the American system the CIA, NSA, FBI, NRO and a whole host of Pentagon and other government agencies play a huge role in the unconstitutional, shadow government. A similar arrangement prevails in many other countries. The shadow government has strong ties to organized crime. Criminal syndicates and operatives such as the Sicilian Mafia (“La Cosa Nostra”), the Japanese Yakuza, Mexican and Colombian narcotics cartels, Chinese Triads, Afghan opium warlords, the Russian- Ukrainian-Israeli Mafia and the Israeli Mafia, to name just a few of many, have secretive ties to governments, intelligence agencies and military organizations, at many levels, all over the world, who use them for money laundering, assassinations, movement of contraband across borders, garden variety criminal operations, narcotics, weapons and human organ and human trafficking, and more. Because of government and mass media propaganda, many people are blinded even to the reality of the existence of the shadow government, much less its massive criminality. But it’s time to wake up and see the reality for what it is. The government of the USSA is not what the people of the world have been told, and the same goes for many other governments. We, the so- called ordinary peoples of the world, have been massively lied to. In 1964, at the height of the Cold War, David Wise and Thomas Ross wrote a book about the secretive machinations of the American government, entitled The Invisible Government, in which they described the “interlocking, hidden machinery that carries out the policies of the United States...” In 1973, Fletcher Prouty, a U.S. Air Force Colonel and former liaison officer between the USSA Air Force and the CIA, issued his own book which went even further: The Secret Team: the CIA and Its Allies in Control of the United States and The World. Prouty revealed that the Secret Team is a powerful, brutally violent, treacherous, international octopus, with many tentacles of influence that extend throughout the world. It has its operatives in many countries (Americans and non-Americans too) in universities and academic institutes (scholars, professors), in intelligence agencies (spies), in military agencies (enlisted personnel and officers), in private industry (businessmen and businesswomen), in the world of finance (bankers, stock brokers, financiers), in the news media (journalists, television personalities), in publishing (book editors). Prouty characterizes this Secret Team as the “real power structure” in our world. Understand that he is talking about a rogue, out of control, international organization that is massively funded, has access to any computer data base, has cutting edge technology, has access to any technical expertise or personnel that it needs and that is also ruthlessly violent. It uses the government of the USSA and other countries as camouflage to hide and disguise its activities. Other similar books have appeared in recent decades. Former British MI-6 agent, Dr. John Coleman, has written his own exposé of the shadowy, totalitarian power plays of European royal houses and powerful international factions allied with their interests. Conspirator's Hierarchy: The Story of the Committee of 300 outlines a nefarious power bloc very much like Fletcher Prouty’s Secret Team, but revolving around the European royal houses instead of the American CIA. Of course, some countries are militarily occupied by others and have a shadow government imposed on them by force. The USSA militarily currently occupies Afghanistan, and also stations military forces in scores of other countries, including in South Korea, Japan and Germany, even though WW II and the Korean War occurred in the mid-20th century, more than half a century ago. China militarily occupies Tibet, it is true, and Israel militarily occupies Palestine, however, over the last half century, the USA has far and away been the primary international aggressor. In the case of Germany, the former head of West German military intelligence, Gerd-Helmut Komossa has in recent years published a book entitled The German Card: The Hidden Game of the Secret Services (Die deutsche Karte. Das verdeckte Spiel der geheimen Dienste) which reveals that in 1949 the USSA forced the government of West Germany to sign a secret agreement with the USSA that ceded German national sovereignty to the USSA until the year 2099, thus rendering Germany a vassal state to the USSA for 150 years. His book caused a big controversy in Germany, but the premise is obvious. Almost 70 years after WW-II, and approximately 20 years after the fall of the Berlin wall, after the reunification of West and East Germany, and many years after the collapse of the USSR, the USSA still stations large numbers of military forces on German soil. There are still dozens of American military bases and facilities in Germany. The conclusion is self-evident. Germany is not presently a sovereign nation, almost 70 years after the end of WW II. And yet this glaring truth is not officially acknowledged, whether in Germany or the USSA. So forget what you were told in school about how government works. It was in large measure carefully contrived fiction and propaganda. I do accept and need donations. If you find something of value in my ideas, writings and adventures you are certainly welcome to support my continued work. For how to donate, please contact me at: dr.samizdat1618@gmail.com for instructions on how to donate. I really liked the Disney film, John Carter of Mars, based on the Barsoom (Mars) series of articles and books written by Edgar Rice Burroughs, starting in 1912. Many critics panned the movie, and though it had a respectable showing, especially outside of the USSA, Disney elected not to do a sequel. I suspect that the movie broached themes that hit a little too close to home for the liking of the Powers That Be, and that Disney was encouraged not to issue a sequel, that might have raised even larger issues. I am talking about issues related to planetary control, and even issues of interplanetary control; issues that have to do with the planetary and interplanetary controllers themselves, the Therns, who are a plausible proxy for The Machine that ayahuasca has showed me: Machiavellian, duplicitous, scheming, ruthless, endlessly devious, planet destroyers. I do not know how Edgar Rice Burroughs, writing a century ago, so eloquently, incisively and artistically summed up the situation on Earth, and likely beyond. I think he must have had access to a body of esoteric or hidden knowledge that he accessed via deep mediation, direct intuition, or was perhaps given by some agent or agency with knowledge of an ancient, occult body of lore handed down through an initiatic organization such as the Free Masons. In any event, I like certain parts of this YouTube clip that analyzes some of the symbolism in the John Carter movie. The part that I want to call to your attention here is the conversation that takes place between the 2:38 and 4:36 mark of this video clip. "We're not haunted by mortality, as you are. We are eternal. History will follow the course we have set ... We've been playing these games since before the birth of this planet (Mars) and will continue to do so long after the death of yours (Earth)... We don't cause the destruction of the world ... we simply manage it, feed off it, if you like; and on every host planet it always plays out exactly the same way, populations rise, societies divide, wars spread. And all the while, the neglected planet slowly fades." I submit to you that this "fictional" revelation by the shape-shifting, planet controlling Therns, is a fair summation of what is happening on Earth today, and perhaps has already occurred on other planets in this solar system, such as on Mars and on the planet that used to be between Mars and Jupiter, the exploded, rocky remnants of which we recognize today as the "Asteroid Belt." Now of course The Matrix is a film, but like all socially relevant art it reflects important cultural truths, especially in the first few scenes of the film. It is in those scenes where the character, Neo, realizes for the first time that absolutely everything that he believed in his life to that point was 100% false, and that reality is far different from the received truth that he was fed from infancy. One of the implicit points of the movie is that most people are Neo — most people are so mind controlled that they have no idea that mind control even exists or how deeply in its grip they are. Many forms of mind control exist on this planet. Some of them are subtle and insidious; some are violently aggressive. But they are all effective, the more so if their intended targets are unaware that they are being victimized and controlled. The technology of mind control takes many forms, including: electronic, audio, chemical, pharmaceutical, social, political, religious, educational, mass advertising, hypnotic and neuro-linguistic. The so-called ruling elite utilize all of these forms of mind control synergistically to socially control and herd the global human population. I can but cite some representative books, websites, patents and researchers to give you an idea of how unbelievably extensive the mind control program is on this planet. The human mind is a subtly powerful thing, and those who would rule this planet with an iron hand would prefer that the human population of Earth not be consciously aware of their dark power plays for planetary control. So they have set in motion a broad range of mind control technologies and woven them seamlessly into every aspect of our lives. I aim simply to point out to you the broad outline of the mind control net that has ensnared us. To escape from the net you first have to see it! Why not start here? -- One of the CIA’s many dark programs in the post World War II era is mind control. In the second half of the 20th century the CIA secretly carried out the Top Secret MK-Ultra mind control program. In 1975 then U.S. Senator Frank Church held the now famous “Church Committee Hearings” to investigate the many illegal and unconstitutional abuses of the CIA and FBI, including assassination, overthrowing other governments, rampant violations of civil liberties, covert mind control research, and the extensive use of misinformation and disinformation in COINTELPRO operations. COINTELPRO operations are counter intelligence campaigns that are aimed at mass deception of the civilian population. Whereas MK-Ultra used psychoactive drugs and hypnosis to alter individual human consciousness, COINTELPRO misinformation and disinformation campaigns are propaganda techniques that fill the minds of a target population with false information, thereby causing them to have a distorted view of reality. Television, radio, newspapers, magazines, the cinema and the Internet are routinely used to flood the public with a steady barrage of false information and misleading propaganda. Of course, these media can also be used to inform or educate people, however when they are used by corporate, religious and governmental organizations and agencies to disinform or deceive, then we must speak of mass mind control, of engineering a false or unreal state of consciousness in the mass mind. The American intellectuals, Noam Chomsky and Edward S. Herman, some years ago published a book, Manufacturing Consent: The Political Economy of the Mass Media, in which they carefully examined how the mass media distort the news and information reaching the public, under pressure from a nexus of governmental, advertising and corporate powers. The so-called “news” that the masses of the population receive is thus slanted and skewed in favor of the vested interests of wealthy mass media advertisers, the powerful corporations who control and own the mass media, and powerful government agencies who create “news” virtually at their whim simply by issuing press releases or holding press conferences. The reality of what is occurring is right in front of all of us, for those who have eyes to see it. The English author, David Icke, has pointed out that even in everyday conversation we speak of television “programs” – of news “programs”, of sports “programs”, of game show “programs”, and so forth. In other words, the daily news “programs” literally program our minds to have a specific, false view of the world advanced by the major media corporations and government agencies. Sports “programs” program viewers, especially young men, to have an aggressive, competitive, winner-take-all mind set. Soap opera “programs” condition their disproportionately female viewing audience to a steady fare of seriously dysfunctional social and familial relationships characterized by endless melodramas of every description. The silly game show “programs” with their gaudy contestant prizes of money, household appliances and consumer electronics program viewers to have a materialistic, consumption oriented mentality, and so on. In other words, most television “programs” are just that – mind control “programs”! The repeated worldwide replaying of the 9/11 attacks on television in 2001 was a text book, global exercise in mass mind control, using a shared mass trauma as a shock to the global consciousness in order to put in place an international regime of authoritarian social control, and to set in motion the so-called “War on Terror”. All of this was deliberately engineered with great malice to further a dark agenda of global mind and social control. A wide gamut of civil government and military agencies, major corporations and mass media organizations assisted in this global mind control charade. The technique they use is garden variety Pavlovian conditioning. Everyone who studies psychology learns of the “conditional reflex” experiments of the famous Russian psychologist, Ivan Pavlov, whose canine research subjects were conditioned to salivate on cue – whether food was presented to them or not. In like fashion, false flag attacks such as the 9/11 attacks provide a horrific, traumatic, terror event to condition the mass mind to the “terror” stimulus and create a base level of fear; thereafter the mere mention by official authority figures of the possibility of terror suffices to arouse a conditioned fear response in the mass mind of the population. If necessary, repeat stimuli in the form of so-called “terror” events may be prominently staged from time to time to maintain the population in a state of fear, in order to make people more pliable and manipulable, both politically and socially. The so-called “ruling elite” have studied Ivan Pavlov’s research very carefully and they apply the results he achieved to the global population. Pavlov used tinkling bells to make his dogs salivate. The Powers That Be use exploding bombs, collapsing skyscrapers, rogue “terrorists” and crashing jet planes to make their human subjects quake in fear. They stage genuine “terror” attacks, or even stage fake “attacks” that fizzle, with the goal of causing the global population to quake in fear in response. The trick for the aware individual is to learn 1) to recognize in the first place that Pavlovian psychological conditioning is being used, and 2) to understand how and why it is being done. Mind control is also extensively used in modern schools. It is a seamless part of the routine, accepted as “normal” and natural by students, teachers and administrators alike. In American schools it is common for the school day to be interrupted numerous times by the harsh clanging of noisy bells – signaling students to sit down, to go to another classroom, or to eat. One is directly reminded of Ivan Pavlov’s conditioned dogs, which salivated on cue upon the ringing of a bell. Moreover, the rigidity of the thought process and social conformity that is drilled into the students’ heads is reinforced by the typical seating arrangement: ranks and files of desks, arranged in orderly rows and exact lines with a minor agent of the state (teacher) in front. Everyone must sit in a desk in the prescribed way, for a prescribed time, and must exclusively read, study and discuss the information that is presented by the state’s agent. Little or no deviation from this routine is permitted upon pain of punishment. In fact, in many countries, children must go to school upon pain of law and there is a very real threat of police intervention against either them or their parents or both if they do not obey! This is mind control of the most direct kind – children are forced to comply with the state mandated, universal, mind control program (school) or the state will take police action against them. Institutional religion is also an ancient, mind control program, with codified rules of prescribed thought and behavior, predicated on eternal reward or damnation in the hereafter, according to the degree of compliance with the religion’s demands. Now that is Pavlovian conditioning carried to the ultimate degree –the mind control victims are told that adherence to the rules of the game is for eternal stakes. Fortunately, in countries where there is constitutionally guaranteed freedom of religion, or freedom from religion, individuals are less encumbered today by the compulsive dictates of institutional religion than they were in past eras. The medieval Inquisition of the Roman Catholic Church is a glaring example of the hideous extremes to which religious mind control can extend. No one knows how many millions of people were hanged, drowned, impaled, burned or boiled alive, decapitated or tortured to death by the Roman Catholic Church in Europe and the Americas. Is it just a coincidence that the Roman Catholic Church has for centuries shown a penchant for loud ringing of bells from its cathedral towers and steeples, as if to emphatically underline the Pavlovian nature of its grim conditioning: submit to the teachings of the Church or be forever damned! Sadly, the Roman Catholic Inquisition has an ominous echo in the many public executions carried out today in Muslim countries such as Iran, Saudi Arabia and Afghanistan, frequently for supposed violations of fundamentalist Muslim tenets. Unfortunately, acceptance of the violence of the state is often conflated with the individual’s supposed religious duties. Unquestioning obedience to the authority of the state is no less true in America than in Muslim societies. In many American Christian churches, for example, it is common to see an American flag, the supreme symbol of the state, standing at the front of the church. In this way, obedience to the state and support for its policies become an integral part of an individual’s religious orientation. The state arrogates unto itself by association with the object of religious worship a sort of quasi-divine status. To be sure, both institutional religion and the state are aware of this dynamic and both use it for their own ends, not only in the USA but also in other countries, whether Iran, Saudi Arabia or Israel. History is replete in both East and West with numerous examples of the inextricable relationship between religious, political and military authority. Many books have been written about the mind control programs of the U.S. government’s alphabet soup of agencies such as the CIA, FBI, NSA and others. A few of the best known of these books are Operation Mind Control, by Walter Bowart, The Search for the "Manchurian Candidate": The CIA and Mind Control, by John Marks, Mind Controllers, by Armen Victorian, and Journey Into Madness: The True Story of Secret CIA Mind Control and Medical Abuse, by Gordon Thomas. It is sad but nevertheless true that for the better part of a century, medical doctors and psychiatrists have worked hand in glove with espionage and military agencies on torture and mind control projects. We are all subject to their foul plots and schemes to a degree, either directly or indirectly. The truth about still other forms of mind control is positively electrifying – and I don’t necessarily mean that in a metaphorical or tongue in cheek sense. As it happens, human beings are many things, and among those many things we are energetically electrical and electromagnetic beings. Among the books which have been written on this subject is, The Body Electric: Electromagnetism and the Foundation of Life, by Dr. Robert Becker and Gary Selden. At a high level, the CIA, FBI, MI-6, Mossad and many other police, espionage, military, industrial and intelligence organizations understand the electrical nature of the human organism and have accordingly developed technologies to electronically manipulate human thought and behavior. In recent years, numerous individuals in the USSA and elsewhere have publicly complained of electronic mind control harassment and torture at the hands of intelligence and espionage agencies of the USSA and also of other countries. The danger posed by electronic mind control to human freedom is very real. The American activist, Sheryl Welsh, has devoted her career to publicizing this critical issue and aiding the myriad victims of these horrific crimes. She has established the Mind Justice website at http://www.mindjustice.org with many links to vital information on mind control. Finnish doctor, Rauni-Leena Luukanen-Kilde, MD, has also been very publicly outspoken about mind control technologies, including micro-chip implants and remote electronic mind control. Her videos and interviews are widely available on the Internet. Many people have fallen victim to the CIA’s and other agencies’ hideous mind control programs. In the book, A Nation Betrayed, former American CIA child mind control victim, Carol Rutz, provides a deeply troubling personal account of her hideous experiences at the hands of her CIA tormentors. One thing that the reader must clearly understand is that modern electronic technology is very advanced, and can actually beam intelligible voices and messages right into the human brain. This is not science fiction or fantasy. It is hard, nuts and bolts, electronic fact. Official U.S. government patents have been granted for this type of technology. Here is the abstract for one such device, a euphemistically named Hearing Device, which describes the basic functioning of an actual brain transmitter. Many researchers have presented evidence and concerns that artificial, electronic manipulation of human consciousness can be carried out on a global scale by the so-called High Frequency Active Auroral Research Program (HAARP) transmitter, operated by the American military at Gakona, Alaska, which beams extremely high-powered electromagnetic energy into the Earth’s upper atmosphere. There are also similar facilities in Norway, Russia and elsewhere in Alaska. Nick Begich and Jeane Manning are among the best known of the HAARP researchers for their underground best-selling book, Angels Don’t Play This HAARP. Begich and Manning reveal that the HAARP technology absolutely does have the capability to broadcast in frequencies that are psychoactive and that influence human behavior and the human mind. This is not science fiction, but science fact. Dr. Begich’s subsequent 2006 book, Controlling the Human Mind, and a companion two-part article in Nexus Magazine entitled “Mind Control: The Ultimate Brave New World,” reveal a stunning array of electronic and audio technologies for controlling and influencing the human mind that is the stuff of nightmares. The new technologies available to government, industry and the military and espionage agencies are capable of remotely detecting and reading people’s thoughts, transmitting voices into their brains, and artificially altering their thoughts and emotions – all without people’s conscious knowledge or consent. To add insult to injury, recent news reports indicate that Israeli scientists and “security” experts are now leading a push to develop and install actual mind reading machines in airports, to scan the minds of airline passengers. As I said above, electronic technology is very advanced and the brain has been well-mapped by neuroscience. We have entered into an Orwellian twilight zone. George Orwell’s 1984 has now arrived and total control of your mind is its objective, with or without your consent, with or without your knowledge. Finally, the food we eat and water that we drink, in the USSA and other countries too, are laden with harmful chemicals. Many examples could be cited, but four of the most egregious are fluoride, aluminum compounds, monosodium glutamate and aspartame. Fluoride is added to about 60% of the municipal water systems in the USA, ostensibly to strengthen teeth. However, as author Christopher Bryson has shown in his book, The Fluoride Deception, fluoride is a dangerous poison with numerous ill effects on human health, including cancer, arthritis, fluorosis, Alzheimer’s disease and Attention Deficit Disorder (ADD). These facts are known to industry and science and still fluoride is added to municipal water supplies as a matter of government policy. Fluoridated toothpaste is also quite common in the USA, and yet, every tube carries a strong warning to contact a poison control center for emergency medical care if the toothpaste is swallowed. Even toothpaste manufacturers know that fluoride is a dangerous poison and still they sell a fluoridated product that people put in their mouths every day! Evidence shows that exposure to both aluminum and fluoride has a harmful, synergistic effect. As it happens, fluoride toothpaste is often packaged in aluminum squeeze tubes. And aluminum is ubiquitous in modern cuisine. Aluminum compounds are often added to table salt and other foods. Aluminum cookware is commonplace. TV dinners and other prepared foods are commonly packaged in aluminum. Drinking water may contain trace amounts of aluminum, because aluminum sulfate is often used by water treatment plants to purify municipal water supplies. Many antiperspirants also contain aluminum compounds that are absorbed by the skin. Aluminum has been linked in some studies to elevated Alzheimer’s risk. The Life Extension Foundation reports that the effects of aluminum toxicity include: “memory loss, learning difficulty, loss of coordination, disorientation, mental confusion, ... and headaches.” There are also severe mental effects from exposure to lead, mercury in vaccines and dental fillings, and other metals as well. Monosodium glutamate is a ubiquitous food additive that is a neurotoxin, i.e., it causes neurological damage to your brain and nervous system. Famous for being added to Chinese food, it is in fact added to a host of prepared foods, including baby food. Another common, very hazardous food additive is aspartame, widely used as a sweet-tasting sugar substitute, also carrying the brand names, NutraSweet, Equal, Spoonful, and Equal-Measure. Some of the dangerous side effects that aspartame can cause are mood disorders, epileptic seizures and brain cancer. This brief article is the barest of introductions to the myriad ways in which the human mind and consciousness are currently under an integrated, synergistic assault from chemical, electronic, political, social, religious, educational and so-called “entertainment” vectors that all pose a threat to your mental and psychological integrity. There is a war being waged by very dark powers for control of your mind and ultimately of your entire being. Are you winning the battle?